Nigeria to Trim 'Fat' Off Govt, Police Force? Abuja — The Deputy Senate President, Senator Ike Ekweremadu, his wife, and son on Tuesday morning escaped being assassinated by armed attackers. The armed men, according to a release by Ekweremadu's media aide, Uche Anichukwu, evaded the security at the Deputy Senate President's Apo Quarters residence in Abuja to gain entry at about 4am. 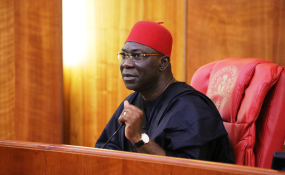 The attackers, who could not immediately shoot in order not to attract the attention of the security personnel on duty, took hold of Ekweremadu's son, and commanded him to lead them to the senator's bedroom. According to the statement, it was at the senator's bedroom that a struggle ensued, leading to the arrest of one of the assailants with dangerous weapons and housebreaking devices, while the rest managed to escape.